A Jeju winter is not all that welcoming. Far from subtropical, 2 degrees with windchill here feels colder than minus 10 in Seoul. Luckily, it is also the time of year that heart-warming foods pop up on our streets to fight off the cold. 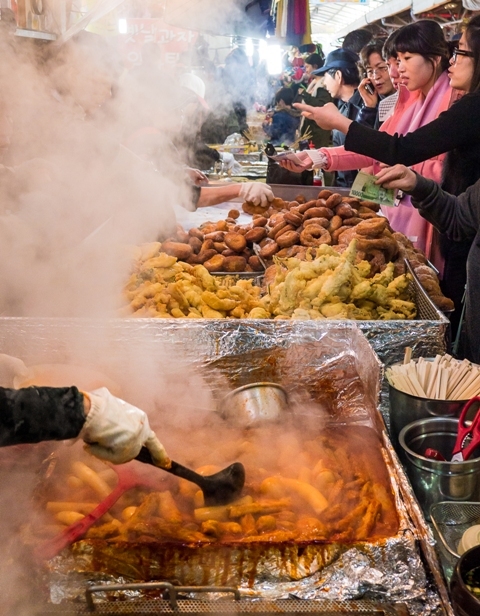 Jeju doesn’t boast the cities of pojang-macha, or food tents that line the streets of Seoul or mainland cities. We do, however, have plenty of street food, or gilgeori eumshik, dotted around in lone tents or vendors and at markets. Below are some winter-nibble options when shopping, waiting for that bus or after a few too many soju. Enjoy! Hotteok is a variety of filled pancake made from wheat flour, water, milk, sugar and yeast. The most popular filling is cinnamon and peanut, but many varieties exist such as the mugwort variety at the 5-day market. This is the most ubiquitous winter street snack. 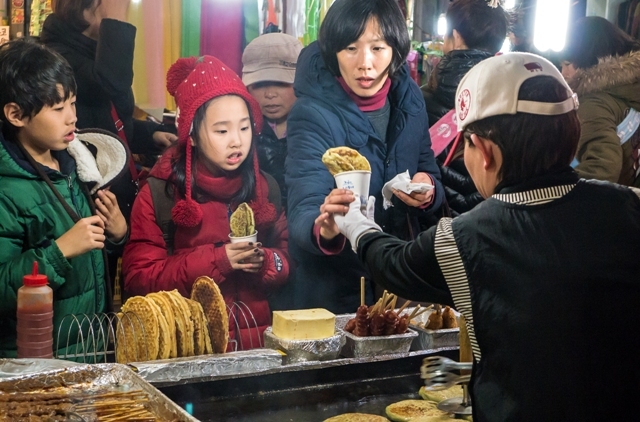 Factoid: 19th-century Chinese merchants brought the pancake to Korea. The Chinese preferred savory fillings, yet the Koreans filled theirs with sugary sweetness, leading to today’s treacle-like variety loathed by expensive scarves. “Pul” is the batter mixture that makes a variety of “ppang” (breads or batters), such as bungeoppang, the most famous. Bungeoppang is made in a kind of waffle iron and the batter encloses red bean paste, although this can be substituted for other fillings. The cream-filled, dragon-shaped yonggari is also pulppang, as is hodu gwaja, which encloses a small chestnut, or hodu. Factoid: Introduced by the Japanese in the 1930s, bungeoppang can also be used to refer to things that look identical, such as a baby resembling a parent. Why? Just look at the waffle iron, reproducing all those identically shaped treats. This is a form of fishcake and invig-orating broth sold from street carts and tents. It is made from ground white fish and other ingredients such as potato starch, sugar and vegetables. It is the perfect winter-warmer and half of the experience is steamily slurping with fellow diners under plastic sheeting, shielded from the elements. 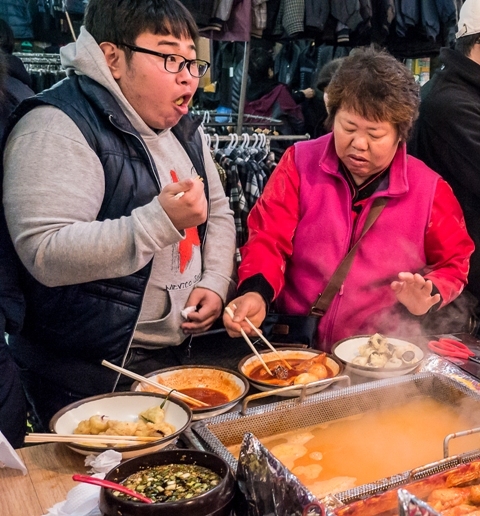 Factoid: Odeng is the Koreanization of the Japanese “ oden.” The traditional term is eomuk. This includes sticks of soft rice cake, odeng and gochujang, or red pepper paste sauce, and boiled egg. The dish, available throughout the year but especially popular in winter, is dominated by the bright red sauce smothering the ingredients, which vary by vendor. Factoid: Although now loved by kids and the hoi polloi, the original was regarded as haute cuisine by the Joseon royal court. Savory, it was made with meat, vegetables, and eggs and served with ginkgo nuts and walnuts. Baked sweet potatoes are cooked in mobile iron barrels often found rolling up around tourist sites during the day, or drinking areas at night. They tend to be sweeter than the steamed or boiled variety and the crispy skin is delicious, although often discarded by locals. Factoid: Sweet potatoes were first brought to Korea in 1764 from Japan by a Joseon envoy seeking hardy crops for a growing population. They had been taken to Japan by the Portuguese in 1735. Roasted chestnuts are loved the world over. Sold by small mobile vendors and served in small paper bags, they can be found near traditional markets and on busy streets. Factoid: In the 1980s it was considered proper for a romantic husband to return from work on a winter’s night with a bag of chestnuts for his beloved. Not just in name, but in size, taste, and downright machismo, this is justifiably the “King of Mandu.” This steamed bun liberally filled with vegetables and meat comes in kimchi and meat varieties. More than a snack, this is dinner-on-the-go. Factoid: Two theories on origin: 1) Mandu were brought to Korea by 14th century Mongolians who were less concerned about meat-eating than the Buddhist Goryeo establishment. 2) Mandu arrived earlier, spreading east along the Silk Road from Mesopotamia like other foodstuffs, such as, some say, noodles. Jeju’s traditional markets: It goes without saying that the best can be found at the traditional markets that dot the island. Jeju City Hall: The alleys of the City Hall district boast many options particularly in the evenings. Jungangno: The street corners of Old Jeju’s main shopping district are full of vendors. Baojian Street (Jewon): Sellers are attracted by the drinkers and tourists, particularly at night. Seogwipo City: The Olle Everyday Market boasts many vendors. Smaller towns: Your best bet is to catch the 5-Day Market or hunt out a vendor at a popular tourist site or busy shopping area.